Jane Eyre is not an easy read even for erudite adults, which means that younger readers may struggle with its wonderfully rich prose. How to capture a teenager's eye and mind without overwhelming him or her? One option: a graphic novel (sort of a book-length version of a comic book). 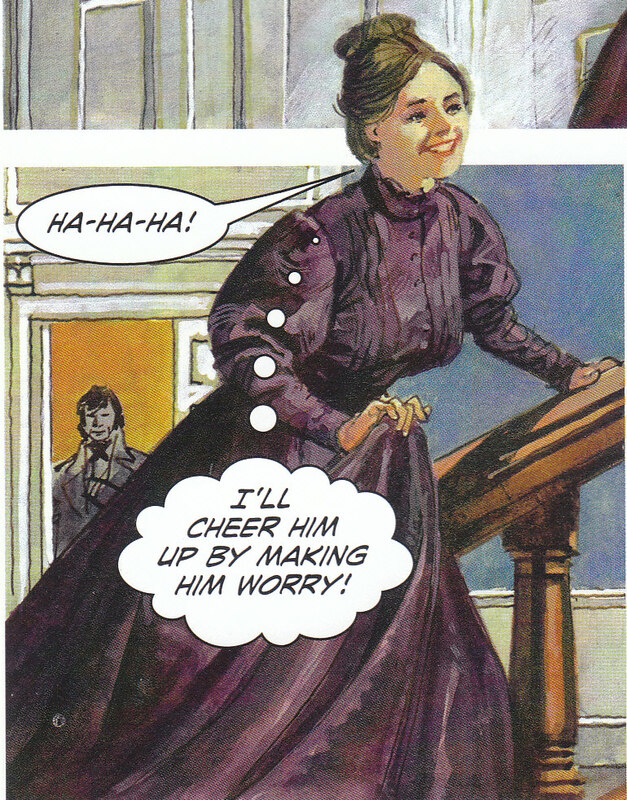 Jane Eyre — the Graphic Novel is available in two versions: "Original Text" (employing Brontë's language where feasible) and "Quick Text" (with simplified words for less advanced readers. My review concerns the latter. The book was published in 2010 by Lucent Books "in association with Classical Comics Ltd." According to a note on the title page, it was "Adapted from an original script by Amy Corzine," which implies that she wrote the words and others created the illustrations. This graphic novel does some things well. It gives a fine overview of the complex story; it includes bits of the original dialogue (albeit often with words changed to simplify the language); and, unlike most film versions of Jane Eyre, it doesn't alter the plot substantially. It's hard to get inside characters' heads when space and words are limited, but the writers occasionally attempted to show what Rochester was thinking. I laughed at the way his thought balloons depicted Jane as an angel or a bird, or St. John as a toga-wearing Greek god. I found the art — particularly the people — rudimentary; for example, eyes sometimes appear to have been penciled in hurriedly and are not focused in the right direction. The proofreading was poor; I spotted numerous "typos" in various parts of the book, including the introduction, the brief biography of Brontë, and even the dialogue in the word balloons. Also, the glossary makes an odd impression with its definitions of very simple and common words. How could a reader get through this book without knowing such terms as "forgive" or "tray" or "weakness"? My overall assessment: Nice try, and likely good enough to enthrall many teen readers, but this graphic novel should have been produced with more care. P.S. The dialogue is written well enough, but sound effects are awfully cartoony. For example, the insane Bertha Mason is depicted in one panel delivering the following soliloquy: "U- HUGG- AHHCHH- FAHG- GRRR- LLOCHLL- BAHG!" ◦ 1934 - the first "talkie"
All contents © 2009-2019 by the owner of JaneEyre.net.